Let’s talk about Thursday night TV! Klaus managed to defeat his Aunt Dahlia and saved his daughter’s life in last season’s finale of THE ORIGINALS, but he also took revenge against Hayley and her fellow pack members for trying to take Hope from them. What’s to come in season 3? Stars Joseph Morgan (Klaus Mikaelson), Daniel Gillies (Elijah Mikaelson), Phoebe Tonkin (Hayley), Charles Michael Davis (Marcel), Leah Pipes (Cami), Yusuf Gatewood (Vincent Griffith) and Danielle Campbell (Davina), along with executive producers Julie Plec and Michael Narducci, were on hand to discuss. We’re less than a month away from Comic-Con, and Warner Bros. has announced its extensive lineup of Con plans. In addition to the returning shows, WB will once again host a massive DC panel on Saturday night, and THE VAMPIRE DIARIES is moving to Hall H on Sunday. 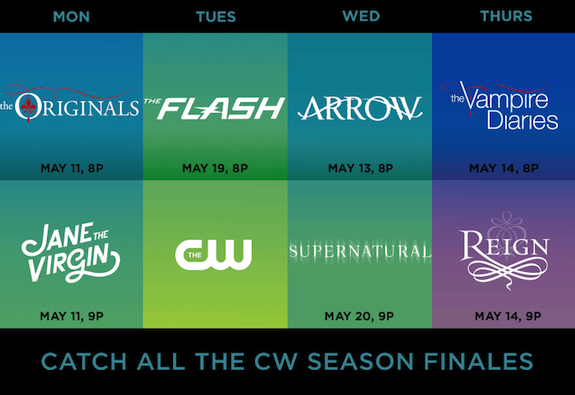 The CW has set its season finale dates…and made a pretty (and useful!) graphic to keep people up to date. It’s Christmas time on THE ORIGINALS, and for our characters, there is the potential for the highest highs (a reunion for Klaus and Hayley with baby Hope), and the lowest lows (Esther’s big plans). The Mikaelson family drama will be on full display during the next new episode of THE ORIGINALS: not only is Rebekah returning, but Klaus and Elijah now have their brothers, Kol and Finn, under their control. And since Kol and Finn have been loyal to their mother up until this point, this could be the tipping point where Klaus and Elijah are finally able to gain some traction…or it could horribly backfire. 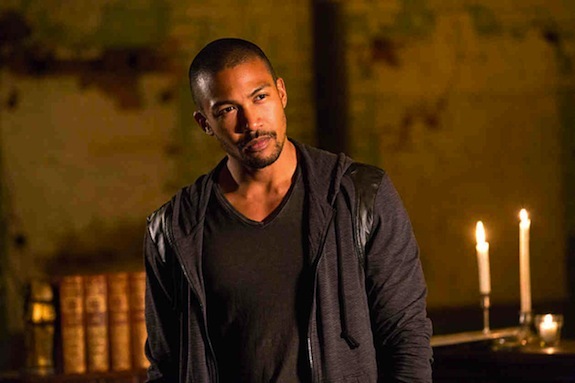 THE ORIGINALS season 2 kicks off tonight! THE ORIGINAL’s second season kicks off tonight at 8 PM on The CW. The cast and producers of THE ORIGINALS hit up Comic-Con on Friday to participate in a panel and a fan signing. Check out some photos from their signing! The CW has released their Fall 2014 schedule and THE ORIGINALS is on the move, THE FLASH won’t be paired with ARROW, but aside from that (and one other new show), things are pretty much the same. Tags: Arrow, beauty and the beast, Hart of Dixie, izombie, jane the virgin, reign, Supernatural, the 100, The CW, the flash, the messengers, The Originals, the vampire diaries, whose line is it anyway? In Case You Missed It…BONES, CASTLE, ARROW, and More! Comments Off on In Case You Missed It…BONES, CASTLE, ARROW, and More! MANHATTAN: Watch the First Teaser Trailer Now! BONES: ‘The Drama in the Queen’ Photo Preview — Brennan Gets a New Squintern! BONES, GLEE, THE FOLLOWING, and More: Check Out Some Behind-the-Scenes Pictures! The CW Announces Summer 2014 Schedule, Including Return of BEAUTY AND THE BEAST, and New Night for WHOSE LINE IS IT ANYWAY? THE ORIGINALS is finally back tonight, and things are as tense as ever as the fight for control over New Orleans rages on. THE ORIGINALS has been off the air for nearly a month, but the show returns this Tuesday with the tension as high as ever. BONES, GLEE, NEW GIRL, and More: Check Out Some Behind-the-Scenes Pictures! Fox Orders Game Show, BOOM!